The New Orleans Saints had a familiar face returning to the quarterback position following a one-year absence as they hosted the Seattle Seahawks in their season-opening game on September 1, 1991. Entering their sixth season under Head Coach Jim Mora, the Saints were coming off a year in ’90 in which their 8-8 record had been enough to qualify them for the playoffs as a Wild Card entry. However, the play of the defense had far more to do with any success the club had than the offense, which dropped from fifth in scoring in 1989 to 25th in the league. 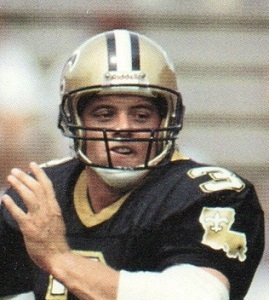 A key factor was the season-long contract holdout by QB Bobby Hebert (pictured above), who had been with the Saints for five years after coming over from the USFL. In addition, the running game was hampered by RB Dalton Hilliard missing 10 games with a knee injury. Both Hebert and Hilliard were back for 1991. 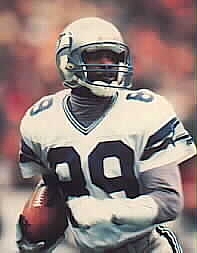 Hebert had beaten out Steve Walsh, the Dallas castoff who had taken over as the starting quarterback in his absence during the ’90 season, in an intense competition during the preseason. As for the Seahawks, coached by Chuck Knox, they barely missed the postseason in ’90 although they had a 9-7 record. QB Dave Krieg had his limitations but was an outstanding leader and the tough defense stood to benefit from the improvement of second-year DT Cortez Kennedy. There was a crowd of 68,492 present at the Louisiana Superdome. Following a short Seattle series that ended with a punt, the Saints went 61 yards in four plays for a score. Bobby Hebert threw to RB Gill Fenerty (pictured below) who went all the way for a 50-yard touchdown. That was it for the first quarter scoring as each team turned the ball over once and the Seahawks again had to punt. However, New Orleans was driving as the period ended and early in the second quarter Morten Andersen kicked a 47-yard field goal to make it 10-0. The home team’s lead became 17-0 in short order when, on Seattle’s first play from scrimmage following the kickoff, Dave Krieg’s pass was intercepted by LB Pat Swilling who proceeded to return it 39 yards for a TD. Now in a deep hole, Seattle came back with an eight-play, 85-yard drive. Krieg hit on all six of his passes, including a completion to RB John L. Williams that gained 35 yards into New Orleans territory and to WR Brian Blades for a 10-yard touchdown. Rookie John Kasay’s successful extra point made it a 17-7 game. The Saints came right back as Hebert threw a screen pass to Dalton Hilliard that gained 13 yards and followed up with a 21-yard completion to TE John Tice to get the ball to the Seattle 29. They advanced as far as the six yard line before Hebert was sacked by DE Jacob Green for a seven-yard loss on a third-and-four play and New Orleans settled for a 31-yard field goal by Andersen. Krieg passed the Seahawks down the field on the ensuing series but, after getting to the New Orleans 14, Blades fumbled when hit after making a catch and the Saints recovered to end the threat. The score stood at 20-7 at the half. The third quarter belonged to Seattle. The Saints had the initial possession of the second half and moved backward from their 21 all the way back to their one yard line. Penalties were the primary reason, including an illegal procedure call that wiped out what would have been a 22-yard gain on a pass play. Backed into a third-and-20 situation, Hebert was sacked for a 10-yard loss by Cortez Kennedy that forced the Saints to punt from their own end zone. Tommy Barnhardt’s 41-yard kick was returned 17 yards by RB Chris Warren to give the Seahawks outstanding field position at the New Orleans 25. Three plays later – and after LB Sam Mills almost intercepted a pass – Krieg threw to Blades, who caught the ball over his shoulder at the goal line for a 25-yard touchdown. Kasay’s extra point made it a six-point game. Three plays after the ensuing kickoff, a long Hebert pass was picked off by CB Dwayne Harper and was returned to the New Orleans 42. Once again starting off with good field position, Seattle advanced to the 19 yard line in five plays that ended with Kasay kicking a 37-yard field goal. With their lead whittled down to 20-17 the Saints made it to midfield on their next series before punting. With the breaks continuing to go Seattle’s way, the punt that was downed at the Seahawks’ 11 had to be kicked over again due to an ineligible man downfield penalty on New Orleans. This time Warren returned the punt 16 yards and, with the help of a facemask penalty, the Seahawks started off at their 30. Krieg threw to Blades for 18 yards and Seattle advanced into New Orleans territory until RB Derrick Fenner fumbled when hit after catching a pass and FS Gene Atkins recovered for the Saints at his own 35. Once again the home team found itself losing ground due to penalties and, on a third-and-19 play, Hebert’s pass was tipped and intercepted by CB Brian Davis, who returned it 40 yards for a TD. The Seahawks took a 24-20 lead into the fourth quarter. The Saints were forced to punt early in the final period but it was Seattle’s turn to run into trouble with penalties. Furthermore, Krieg suffered a broken right thumb while scrambling and, after completing a pass, was replaced by backup QB Jeff Kemp. The Seahawks punted and New Orleans followed up with a long, 14-play scoring drive that covered 68 yards. Along the way, Hebert converted a third-and-11 situation with a completion to WR Eric Martin for 17 yards to the Seattle 34. The Cajun quarterback also ran for nine yards and, on a third-and-one play, gained two yards on a quarterback sneak and another first down. Finally, facing fourth-and-goal at the 10 yard line, Hebert threw to WR Floyd Turner in the middle of the end zone for a touchdown. It was his fifth completion in eight pass attempts during the series that used up some six minutes. Andersen’s extra point made it a three-point lead for the Saints with the remaining time down to 1:11. The Seahawks weren’t done, however, and Kemp threw to Blades for a 31-yard gain to the New Orleans 42 with 39 seconds left on the clock. A pass interference call gained another 34 yards for Seattle down to the eight. While a false start moved the ball back five yards, following an incompletion Kemp connected with Blades for nine yards to the four. However, a pass initially caught by WR Tommy Kane in the end zone was ruled out of bounds and the Seahawks were then penalized 15 yards for unsportsmanlike conduct when Krieg strayed too far down the sideline while vehemently protesting the call. Facing a fourth down with 18 seconds remaining, overtime still appeared likely, but Kasay’s 37-yard field goal attempt sailed wide to the left. New Orleans came away with a 27-24 win. Seattle significantly outgained the Saints (348 yards to 244) and had more first downs (19 to 13). Neither team was able to run effectively, with the Seahawks compiling 46 yards on 15 carries and New Orleans gaining 43 yards on 20 attempts. Seattle also sacked Hebert four times, with Jacob Green accounting for two of them. The Seahawks turned the ball over four times, to three suffered by New Orleans, and both teams hurt themselves with penalties, with 10 called on the Saints at a cost of 85 yards and 9 on Seattle for 66 yards. Bobby Hebert completed 18 of 29 passes for 226 yards and two touchdowns as well as two interceptions, and was at his best in the game-winning drive in the fourth quarter. Eric Martin and Floyd Turner each caught four passes, for 49 and 37 yards, respectively, although Gill Fenerty, who ran the ball five times for 14 yards had the most receiving yards for the Saints with 66 on his three catches that included a TD. Dalton Hilliard was the team’s top rusher with just 18 yards on 9 attempts. For the Seahawks, Dave Krieg was successful on 26 of 35 throws for 274 yards and two TDs while also tossing two interceptions before he had to leave. Jeff Kemp completed four of six passes for 53 yards in relief. Brian Blades (pictured at right) had a noteworthy performance as he accumulated 12 catches for 160 yards and two touchdowns. John L. Williams was the leading rusher with 22 yards on 6 carries but also caught 8 passes for 80 yards. The Saints went on to win their first seven games on the way to topping the NFC West with an 11-5 record (the franchise’s first division title). They again failed to win in the postseason. 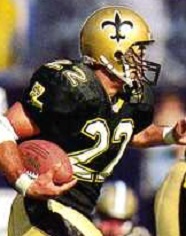 Bobby Hebert’s return to the team paid off, but when he was lost for six weeks with a shoulder injury the Saints slumped. He ended up completing 60.1 percent of his passes for 1676 yards and 9 touchdowns. The running game remained a chronic problem as Dalton Hilliard again struggled with injuries. Seattle lost three of its first four games and ended up fourth in the AFC West with a disappointing 7-9 record. Dave Krieg missed six weeks due to the injury sustained in the opening contest. Brian Blades went on to catch 70 passes for 1003 yards and John L. Williams had a Pro Bowl year as he rushed for 741 yards and caught 61 passes for 499 more yards. John Kasay recovered from his game-ending missed field goal attempt against the Saints to connect on 80.6 percent of his three-point tries (25 of 31) in his first of four seasons with the Seahawks and 20 in the NFL.